In the near future, I’m going to be sharing some spam with my students, and not for the reason you’d think I’d do it. While teaching how to tell the difference between actual important emails and unsolicited commercial and/or malicious emails is important, that won’t be the primary goal. You might think that things are different now that there are services that crowd-source ratings, and you’d be right. Rotten Tomatoes and Yelp are the first that come to mind, but Amazon’s reviews and YouTube’s Like and Dislike buttons also come in to play here. Unfortunately, not all crowd-sourced criticisms are created equal. The goal of my upcoming lesson will be to improve how well my students articulate themselves when critiquing things they like or dislike. Seems like a nice bit of commentary. I mean, they’ve told me I have room for improvement, but they lead with something nice to say so the comment seems thoughtful and well-rounded. Guess which post they were commenting on. This comment could more or less be attached to any of my posts where I explain something and still have it mostly make sense in context. There’s nothing in here to show that the person who wrote it actually read anything on my blog other than the tag line, and that we can only guess because their name and web address (which I censored since I’m not giving their college loan site free advertising) have something to do with education. OK, it was probably a bot that posted, but technically the bot still reads key words. This is a common attribute for spam, but this is not something I expect from students. I’ve recently ramped up the amount of time spent doing peer critiques in my Media Arts classes. The main setup is the subject of a blog post for another day, but one of the hurdles we have to navigate involves generic criticism. It’s all well and good to say that you liked a video. It’s also OK if you say you didn’t like it, since not everyone has the same tastes. But neither of those opinions works well in a critique setting if you don’t say WHY. 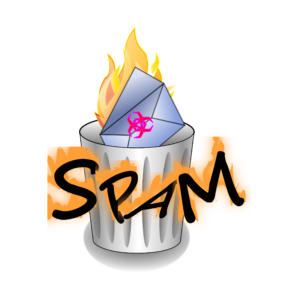 The more my students dig down into their reasoning, the less likely they are to give criticism that would get caught in a spam filter.